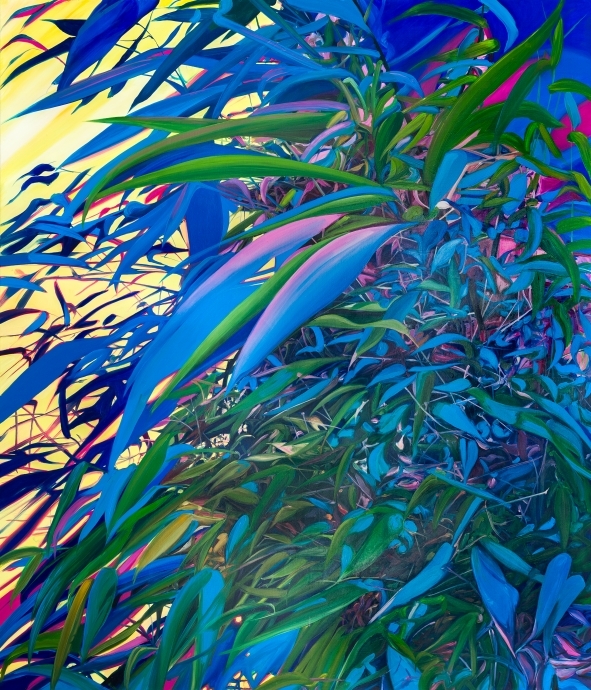 Locks Gallery is pleased to present Soft Estate, an exhibition of new works by London-based artist Kate Bright (b. 1964). 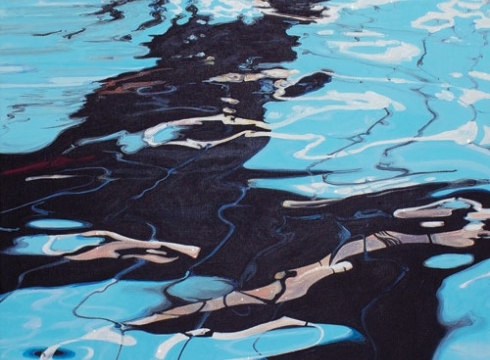 Bright’s previous series are well recognized for their incorporation of non- traditional material such as glitter, styrofoam, and glass in the portrayal of natural, non-figurative landscapes including scenes depicting glitter soaked snowfall, and glistening reflections on the surfaces of ponds and pools. 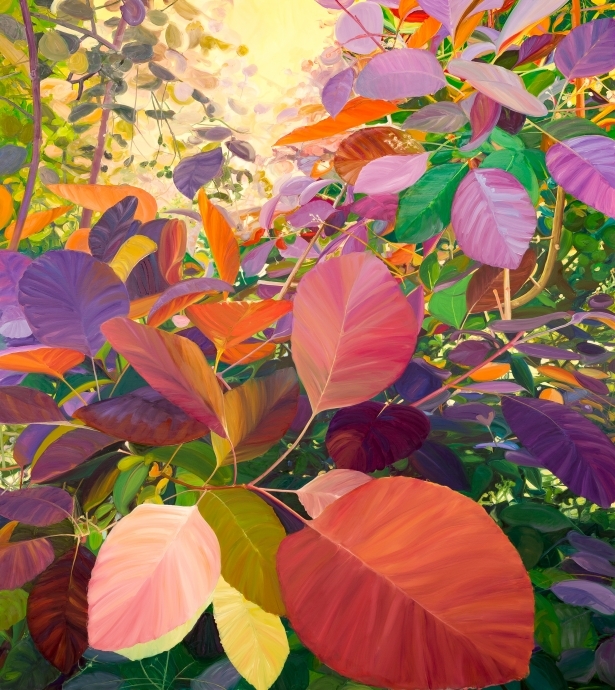 In this new suite of paintings, the artist forgoes cooler seasons and the use of synthetic materials for vibrant depictions of wild British flora in saturated, tropical palettes. 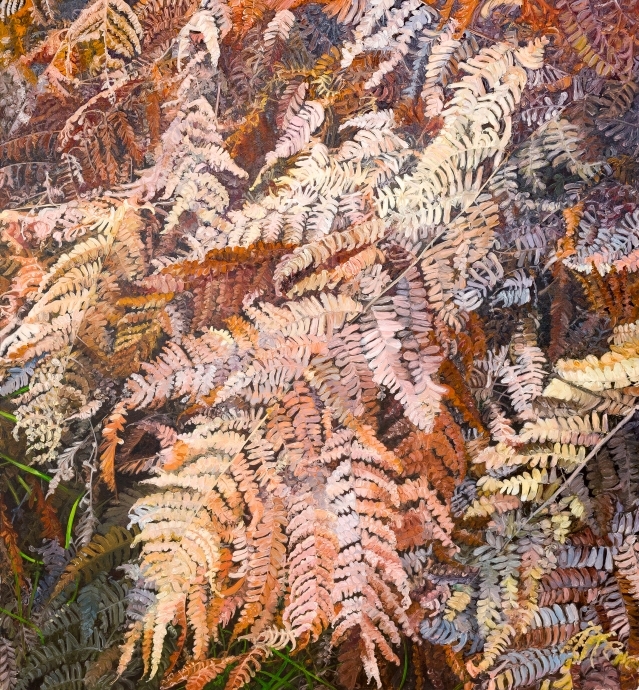 To accompany the exhibition, a new publication has been published by Locks Gallery to survey Bright’s 20 year career. Soft Estate refers to the wild green corridors that run along highways and roads managed by the United Kingdom’s transportation agency. These latent green spaces are not primed for the peaceful introspection of Bright’s previous locales—emerging into view for only a split second and then vanishing, leaving just a brilliant shock of shape and color in one’s mind. 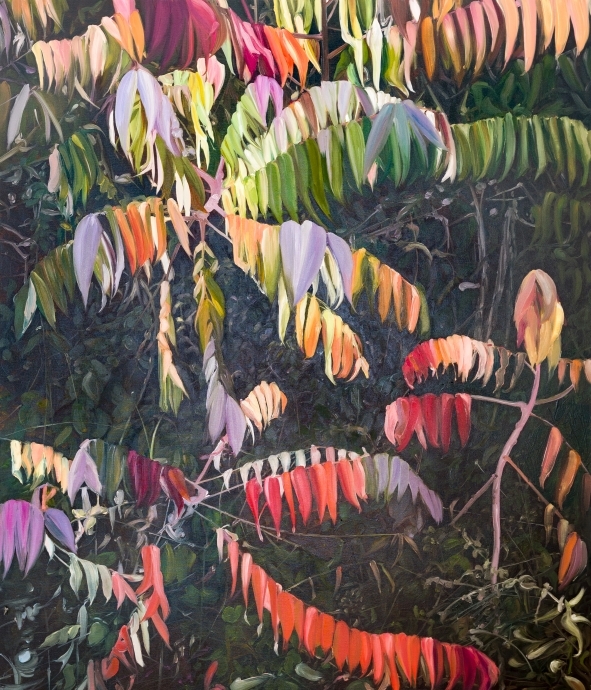 Re flecting on the oversaturation that has become ubiquitous of contemporary visual reality, Bright’s highly sensual compositions emit synesthetic illusions in the form of a gentle breeze ebbing from the pastel hues of Understory (2018); the rustling of dried ferns and branches in Shelter Belt (2017) and the nuclear hum radiating from the otherworldly Blue Bamboo (2018). This collection represents a departure for the artist from the secondary sources of disparate locations to enigmatic depictions of British plantlife cut with tropical shades that render it simultaneously alien and achingly familiar. 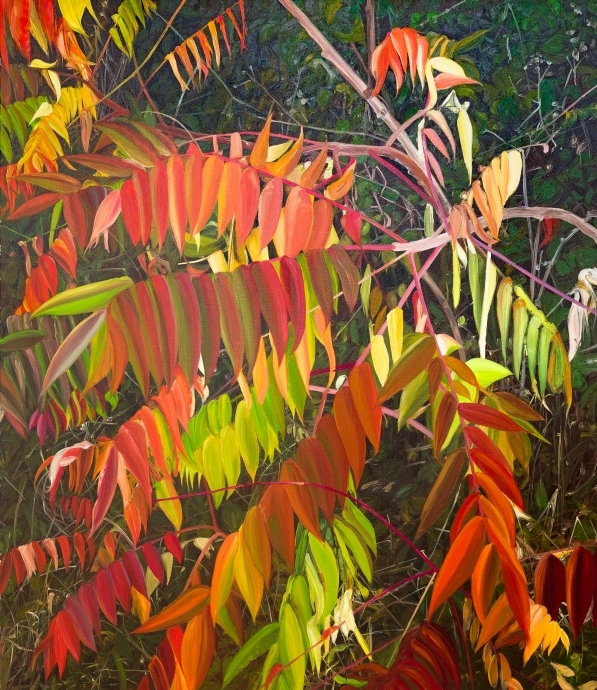 Despite this radical shift, Bright maintains her focus on articulating the illusion of the landscape, relaying our slipping grasp on the natural realm, and perhaps, providing a spark to reignite an empathetic connection with our environment. Bright studied at Camberwell School of the Art and Goldsmiths College and has long taught at the Slade School of Fine Art at the University College of London. The artist has had solo exhibitions at the Centro Internacional de Arte de Salamanca, Spain; The New Art Gallery Walsall, UK; Vitamin Contemporary Art, Turin, Italy; and the Laing Art Gallery, Newcastle, UK. Bright was notably included in the British Art Show in 1990, a major traveling survey exhibition showcasing contemporary art held every five years in the UK.